A map of early human migrations. 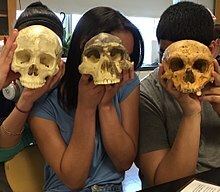 According to the recent African origin of modern humans theory, modern humans evolved in Africa possibly from Homo heidelbergensis, Homo rhodesiensis or Homo antecessor and migrated out of the continent some 50,000 to 100,000 years ago, gradually replacing local populations of Homo erectus, Denisova hominins, Homo floresiensis, Homo luzonensis and Homo neanderthalensis. Archaic Homo sapiens, the forerunner of anatomically modern humans, evolved in the Middle Paleolithic between 400,000 and 250,000 years ago. Recent DNA evidence suggests that several haplotypes of Neanderthal origin are present among all non-African populations, and Neanderthals and other hominins, such as Denisovans, may have contributed up to 6% of their genome to present-day humans, suggestive of a limited inter-breeding between these species. 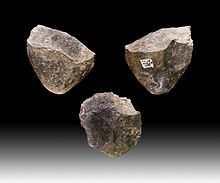 The transition to behavioral modernity with the development of symbolic culture, language, and specialized lithic technology happened around 50,000 years ago according to some anthropologists although others point to evidence that suggests that a gradual change in behavior took place over a longer time span. 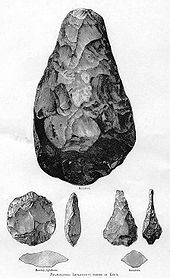 A small number of specimens from the island of Luzon, dated 50,000 to 67,000 years ago, have recently been assigned by their discoverers, based on dental characteristics, to a novel human species, H. luzonensis. ^ Fleagle, John; Gilbert, Chris (2011). Rowe, Noel; Myers, Marc (eds.). "Primate Evolution". All The World's Primates. Charlestown, RI: Primate Conservation, Inc. Retrieved 2015-04-27. ^ Détroit, F.; Mijares, A. S.; Corny, J.; Daver, G.; Zanolli, C.; Dizon, E.; Robles, E.; Grün, R. & Piper, P. J. (2019). "A new species of Homo from the Late Pleistocene of the Philippines". Nature. 568 (7751): 181–186. doi:10.1038/s41586-019-1067-9. Bogin, Barry (1997). "The Evolution of Human Nutrition". In Romanucci-Ross, Lola; Moerman, Daniel E.; Tancredi, Laurence R. (eds.). The Anthropology of Medicine: From Culture to Method (3rd ed.). Westport, CT: Bergin & Garvey. ISBN 978-0-89789-516-3. LCCN 96053993. OCLC 36165190. Brues, Alice M.; Snow, Clyde C. (1965). "Physical Anthropology". In Siegel, Bernard J. (ed.). Biennial Review of Anthropology 1965. Biennial Review of Anthropology. 4. Stanford, CA: Stanford University Press. ISBN 978-0-8047-1746-5. ISSN 0067-8503. LCCN 59012726. OCLC 01532912. Galinon-Melenec, Béatrice (2015). "From "Traces" and "Human Trace" to "Human–Trace Paradigm"". In Parrend, Pierre; Bourgine, Paul; Collet, Pierre (eds.). First Complex systems Digital Campus World E-Conference. Tempe, Arizona: Springer. Montgomery, William M. (1988) [Originally published 1974]. "Germany". In Glick, Thomas F. (ed.). The Comparative Reception of Darwinism. Chicago, Illinois: University of Chicago Press. ISBN 978-0-226-29977-8. LCCN 87035814. OCLC 17328115. "The Conference on the Comparative Reception of Darwinism was held in Austin, Texas, on April 22 and 23, 1972, under the joint sponsorship of the American Council of Learned Societies and the University of Texas at Austin"
Martin, Robert D. (2001). "Primates, Evolution of". In Smelser, Neil J.; Baltes, Paul B. (eds.). International Encyclopedia of the Social & Behavioral Sciences. International Encyclopedia of the Social & Behavioral Sciences (1st ed.). Amsterdam; New York: Elsevier. pp. 12032–12038. doi:10.1016/B0-08-043076-7/03083-7. ISBN 978-0-08-043076-8. LCCN 2001044791. OCLC 47869490. McHenry, Henry M. (2009). "Human Evolution". In Ruse, Michael; Travis, Joseph (eds.). Evolution: The First Four Billion Years. Foreword by Edward O. Wilson. Cambridge, Massachusetts: Belknap Press of Harvard University Press. ISBN 978-0-674-03175-3. LCCN 2008030270. OCLC 225874308. Ramachandran, Sohini; Hua Tang; Gutenkunst, Ryan N.; Bustamante, Carlos D. (2010). "Genetics and Genomics of Human Population Structure". In Speicher, Michael R.; Antonarakis, Stylianos E.; Motulsky, Arno G. (eds.). Vogel and Motulsky's Human Genetics: Problems and Approaches (4th completely rev. ed.). Heidelberg; London; New York: Springer. doi:10.1007/978-3-540-37654-5. ISBN 978-3-540-37653-8. LCCN 2009931325. OCLC 549541244. Robinson, J.T. (2008) [Originally published 1963; Chicago, Illinois: Aldine Transaction]. "Adaptive Radiation in the Australopithecines and the Origin of Man". In Howell, F. Clark; Bourlière, François (eds.). 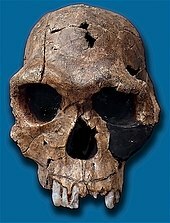 African Ecology and Human Evolution. New Brunswick, NJ: Transaction Publishers. ISBN 978-0-202-36136-9. LCCN 2007024716. OCLC 144770218. Stringer, Chris B. (1994) [First published 1992]. "Evolution of Early Humans". In Jones, Steve; Martin, Robert D.; Pilbeam, David (eds.). 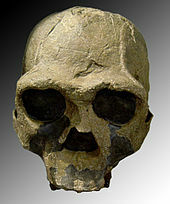 The Cambridge Encyclopedia of Human Evolution. Foreword by Richard Dawkins (1st paperback ed.). Cambridge, UK: Cambridge University Press. ISBN 978-0-521-32370-3. LCCN 92018037. OCLC 444512451. Walker, Alan (2007). "Early Hominin Diets: Overview and Historical Perspectives". In Ungar, Peter (ed.). 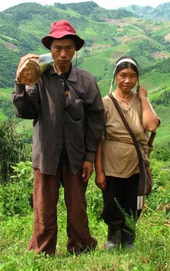 Evolution of the Human Diet: The Known, the Unknown, and the Unknowable. Human Evolution Series. Oxford; New York: Oxford University Press. ISBN 978-0-19-518346-7. LCCN 2005036120. OCLC 132816551. Wood, Bernard A. (2009). "Where Does the Genus Homo Begin, and How Would We Know?". In Grine, Frederick E.; Fleagle, John G.; Leakey, Richard E. (eds.). 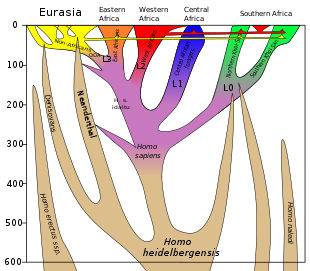 The First Humans: Origin and Early Evolution of the Genus Homo. 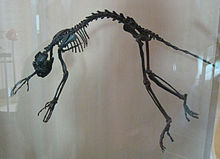 Vertebrate Paleobiology and Paleoanthropology. Dordrecht, the Netherlands: Springer Netherlands. pp. 17–28. doi:10.1007/978-1-4020-9980-9_3. ISBN 978-1-4020-9979-3. ISSN 1877-9077. LCCN 2009927083. OCLC 310400980. 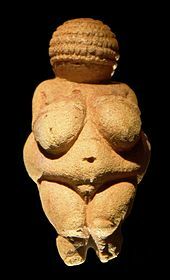 "Contributions from the Third Stony Brook Human Evolution Symposium and Workshop October 3–7, 2006."